There are three additional parts to a traditional roofing system that help to tie everything together, add to visual appeal and help prolong the life of the roof and, ultimately, the building itself. Fascias, Soffits and Bargeboards are an essential part of any roof and we supply and fit them here, but what exactly are they and where can they be found? These three features can be found at the edge of the roof, in particular where the top of the exterior wall meets the roof. Primarily used to improve the aesthetics of a roof, these features also help protect the roof and wall from the elements. Knowing where they are is one thing, of course, but what exactly are they? Bargeboards can have a large, visual impact on a home being attached as they are to a roof’s gables. Of course, this is intentional since the primary purpose of bargeboards is to make that part of the roof / building look better. Of course, they also serve a more practical function in that they cover any exposed materials and help protect them. Normally made from wood, they can be matched in colour and pattern in order to suit the home. Which Bargeboard should I choose? The process of choosing your barge boards is near identical to that of choosing your fascia. There are different types, naturally, such as square, bullnose and flat. Materials available are wide and varied so you will never be stuck for choice. Maintaining your barge boards is simplicity, but a common mistake is simply placing new boards over old. This simply accelerates the deterioration of the board (in the case of wooden boards), and possibly the fascia too. Fasc ias run horizontally along the roofline and can be made from either plastic or wooden boards. The purpose of the fascia is to cover fittings and ensure that they are waterproof and protected. Fascias also help to secure the last row of roof tiles,keeping them securely in place while looking good doing it. Available in a variety of patterns and colours so you can match them to the style of the building. Cypress is one of the more popular materials, mostly because it is less prone to decay over extended periods of time. The grain texture of cypress wood also makes it much less prone to splitting and bending than most other materials. There are many types of fascia boards, as well as material types, so be sure to speak to a specialist before deciding on the one you want. of the property. Soffits generally include integrated vents that allow cool air to circulate under the roof. 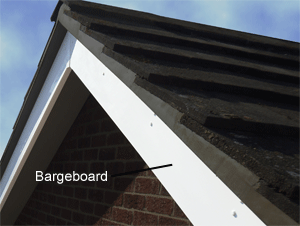 Decayed soffits can have negative effects on rafters, shingle moulds and fascias. There are multiple reasons why soffits can degrade, such as excessive rain and even nesting birds. DIY repairs are not recommended as there are several factors to take into account so it is always advisable to leave repairs to an expert but do ensure that the edges are coated with a water-resistant sealant. One of the most common soffit types is the hollow variety. Cost effective and relatively simple to put up they are often preferred by the DIY enthusiast. If you do decide to do it yourself, although we do advise that a professional be contacted, you do need to be sure you have all the relevant safety equipment. Every wanted to know why most roofs have guttering? 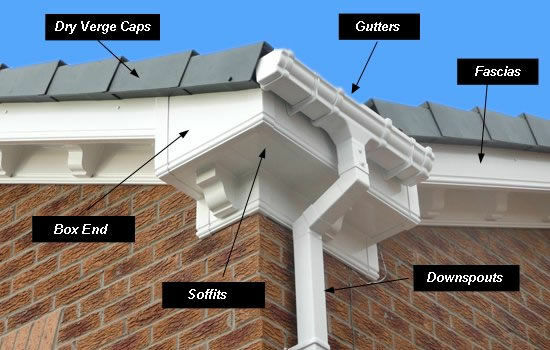 Well we also explain what gutters do.